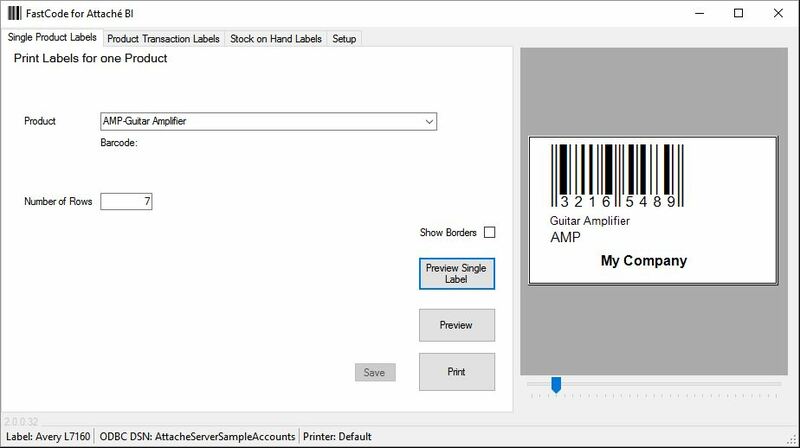 FastCode prints barcode labels directly from product information held in Attaché. Eliminates the need for dedicated barcode printing system with a separate product database. Select from a range of predefined label layout definitions. Labels can include Selling Price, Product Code, Product Description and Barcode; all directly from data in Attaché BI. Works with any Windows compatible printer including laser printers and dedicated barcode printers with Windows drivers. Prints EAN 8, EAN 13 and Code 128 barcodes. Vertical and horizontal offset adjustments can be applied to compensate for printer position variations. Select label price from Attaché price codes 1 to 6 at any time.